For those not on board the Tootsie Tourist Train on 7 December 1983 or present at the station to witness the inaugural journey from Mossel Bay to Knysna and back, the Thursday edition of the George and Knysna Herald dated 8 December 1983 announced the auspicious event - South Africa’s latest tourist train had arrived on the Garden Route. The Minister of Transport, Hendrik Schoeman had introduced a new train journey on the Outeniqua Line and the Minister was among the 140 VIPs that clambered aboard the train in George for its inaugural journey. Prime Minister, PW Botha got the red carpet treatment when he boarded the train in Wilderness with the S.A. Railways Police Brass giving all the passengers a rousing send off as the train chuffed out the station. Mr Hennie Harmse, the Chief Director of SATS (South African Transport Services) said that the aim of the Tootsie Tourist Train was to lure people back to train travel as this mode of transport had dropped from 18 million white passengers in 1845 to 2 million by 1980. Subsequently, many children had never experienced a train ride. The daytrip would introduce passengers, both adults and children to the thrill that train journeys provide especially as the Garden Route was alleged to offer one of the most scenic train routes in the world. Tootsie was a moving museum for steam engine enthusiasts. 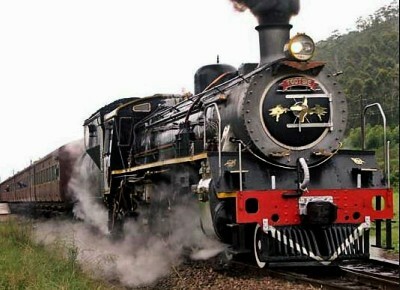 From Mossel Bay to George the train was drawn by an old Garret engine built in 1954 called Black Beauty. 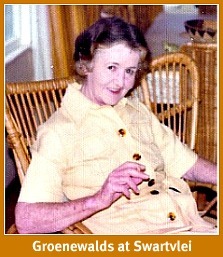 From there two 24 class engines called Noeline and Madelyn built in 1949 were hooked on to her. 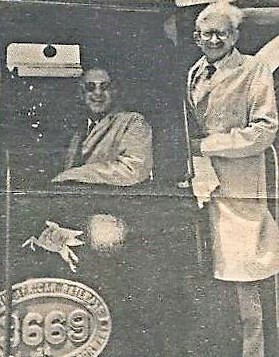 The exclusive Tootsie Tourist Train was able to carry 360 passengers of all races in her 8 coaches which would otherwise have been scrapped or sold off. These included suburban side-door coaches, 1st class mainline coaches with coupès and compartments, a lounge car that seated 45 people and provided a bar service while a separate catering coach sold fast foods and refreshments. 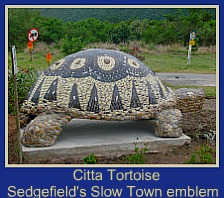 The return trip cost adults R13.50 while children under 12 paid half price. The Tootsie Tourist Train was designed to become a regular feature of the Garden Route Christmas season. 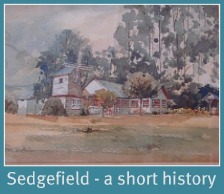 Three days a week –Tuesdays, Thursdays and Saturdays, Tootsie would leave Mossel Bay Station at 6am and chuff her way to Knysna stopping at 9 stations on the way. After an hour in Knysna during which she was turned around for the return journey she would steam her way back to Mossel Bay finishing her day-trip by 6:18pm. Passengers could hop on or off the train at any stopping point of the journey. 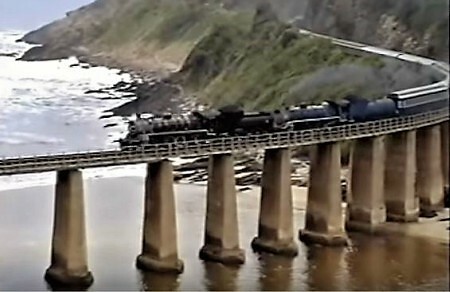 The Outeniqua Choo Tjoe would continue to run on days the Tootsie didn’t run but it only travelled between George and Knysna and excluded the lounge and refreshment coaches. After further investigation, because I had never heard of The Tootsie Tourist Train and through contacting some steam locomotive aficionados I discovered some interesting facts about Tootsie. The name of the locomotive is misleading. 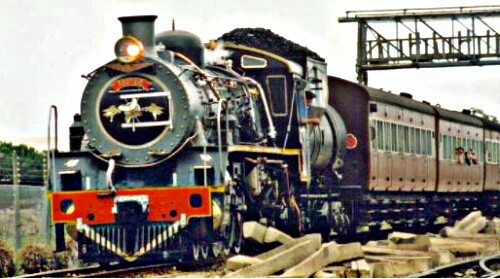 Engines can be traced through their numbers usually emblazoned on the side of the locomotive but the name on the smokebox door at the front of the locomotive near the headlight is removable and belongs to the owner/driver and crew so the name is frequently transferred to another locomotive. This can happen several times as it did with the name "Tootsie"! Thanks to Dylan Knott's assistance I was able to trace Tootsie as he gave me the following information. These locomotives at varying times bore the name Tootsie. Class 19D 3324 - out of service at Voorbaai 2018 this was the first Garden Route Tootsie Train locomotive in 1983. Class 24 3669 - scrapped 2000. Class 24 3684 - scrapped 2000. Class 19D 2753 - scrapped 2004. 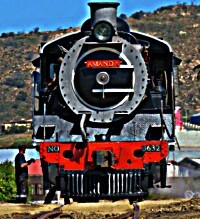 Class 24 3632 - sold, refurbished and renamed Amanda. Class 19D 2640 - under repair at Voorbaai 2018 - will be named Tootsie. 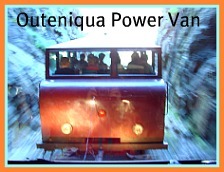 The first Tootsie of the Tourist Train was also used more regularly as one of the Outeniqua Choo Tjoe trains as you will see if you watch some of the YouTube videos of Steam Locomotives on the Garden Route. The good news is that Class 24 3632 locomotive that was also Tootsie on the Garden Route for quite a while was bought privately by Steam Engine enthusiasts Dylan Knott and Ian Welch (Australian) and refurbished at Voorbaai, Mossel Bay in 2016. See the video here: https://www.youtube.com/watch?v=6xGpMxmYuZM&t=99s. Hopefully she will ride the rails again as “Amanda” (named after Dylan’s better half, he says) here along the Garden Route on the Knysna line once it has been repaired. HAPPY DAYS! And the Class 19D 2640 that is under repair at Voorbaai as of 2018 will be readied for service and become the new Tootsie! How cool is that? That's why I have a subtitle in the page title - Back to the Future - let's hope it happens! Meanwhile Classic Rail is waiting for final acceptance of its business plan from the Transnet governance structures so that it can be presented to the Minister of Public Enterprises for approval. 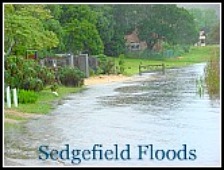 Meanwhile work on the line in the Knysna vicinity has been under way for some time. 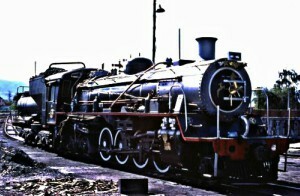 "Friends of the Choo Tjoe"' Gallery page has some great photos here. 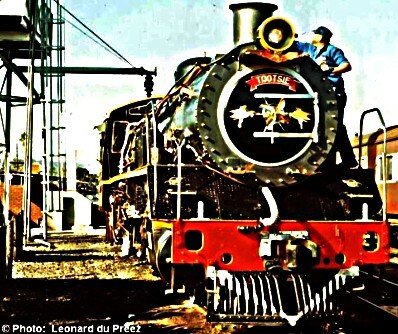 Official site for the revived Outeniqua Choo Tjoe - the beloved steam train that once ran between Knysna and George, and which we plan to have puffing again as soon as possible. 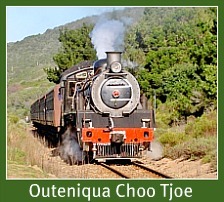 The Outeniqua Choo Tjoe: owned and operated by Classic Rail.